With a live, local, community-oriented focus, the WOLF serves up North Country’s best country music. Our line-up starts with the Wake Up from 6am to 10am with Tony Lynn. Great national coverage and talent is provided by Whitney Allen’s Big Time from 7pm to 12am Monday-Saturday and After Midnight from 12am to 6am Monday-Sunday. Country Countdown USA is hosted by Lon Helton and a different country star every Sunday from 11am-2pm. Local news, weather and sports, skiing, boating and fishing reports keep the community up-to-date. The Wolf Den on Friday mornings give community leaders and local events the spotlight, while Wolf-Bites keeps fans up to date on important community events throughout the week. 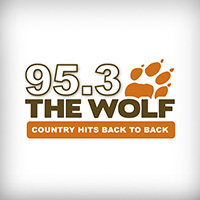 95.3 The Wolf is also the flagship station for Division I ECAC Hockey with the St. Lawrence University’s Skating Saints! Coverage Area: The Wolf devours the entire North Country from Southern Ontario to Massena and Watertown, to Lowville – reaching Jefferson, Lewis and St. Lawrence Counties.